How much will it cost me for you to represent me? What is a contingency fee? I’m not sure about suing. Can I take some time to decide? I don’t live in California, so why should I contact Kazan Law? How large a settlement or judgment can I expect to recover? What if I am very ill? Will I be required to spend a lot of time on the lawsuit? How long will it take before I receive any money? What are the differences between a third party civil case and a workers’ compensation case? If you decide to retain Kazan Law as your attorneys and we agree you have a claim, we will work for you on a contingency basis. That means we are only paid after a judgment has been won or a settlement reached in your case. You do not pay us up front and you will never get bills from us. We do not charge by the hour. Instead, a portion of the money awarded to you will go to this office and the rest will go to you. Kazan Law will provide you and your family the most in depth mesothelioma help and legal information to assist you in making your decision. It also means that if you decide to go to trial and the jury decides against you, you will get nothing and will owe us nothing. If we take your case, we will take the risk of not being paid. Most plaintiffs’ attorneys in civil cases operate on a contingency fee basis, with some charging up to one-half the recovery. However, the percentage of the contingency fee is not the only factor; a lot depends on when the contingency fee is subtracted. Many attorneys take their percentage first and then subtract the costs of the lawsuit out of the client’s share. Kazan Law subtracts the costs first—before the money is divided—so that we share the costs with the client. Our clients therefore get a larger proportion of the money awarded. This depends on the legal deadlines, called statutes of limitations, which might apply to your potential case. These statutes are complex, they depend on the kind of case you are pursuing and they vary from state to state. It is prudent to contact an attorney as soon as possible because once your statute has expired you are forever barred from pursuing your claim. Our attorneys have successfully represented over 1000 people with mesothelioma, living in all parts of the United States, Canada, Mexico, the United Kingdom and elsewhere. We have over 30 years of experience in asbestos litigation. California courts are more receptive to asbestos lawsuits than those in some other parts of the country, so this is where we file all our cases. For a straightforward legal matter it usually makes sense to contact a local attorney. 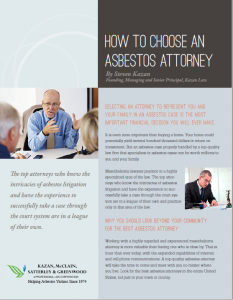 However, for a complex issue—such as asbestos litigation—clients are often best served by attorneys who have a lot of experience in that specific field. It therefore becomes more important to contact the best attorney rather than a local attorney. The question about where to file an asbestos lawsuit can only be answered on a case-by-case basis after examining all the facts. While some jurisdictions—e.g., California—are more favorable than others, it is not always possible to file in California. The assurance we give to everyone with mesothelioma or asbestos cancer who contacts us is that we will evaluate all aspects of the case to decide where the case should be filed. If we believe that California is not the right place for your case, we will discuss this with you and put you in direct contact with an associated attorney whose work we know and trust and who practices in an appropriate jurisdiction, and we will work with this attorney throughout. The value of your potential claim depends on many things, such as the medical evidence that confirms your diagnosis, how seriously you have been injured, your actual and potential losses, the strength of the identification of the toxic products to which you were exposed and the companies that made these products and their financial resources. We cannot guarantee a recovery, but we guarantee we will work hard for you. A big part of our job is protecting you and your family from the stresses involved in pursuing a complex lawsuit. That said, we will, of course, need your help. The extent to which we will need your participation depends in large part on whether or not we can settle your case and avoid a trial. What you can be completely certain about is that our attorneys and staff will walk you and your family through each stage of the lawsuit. We will do our best to acknowledge that you have personal and medical priorities, as well as legal matters that need your attention. We have, after all, been doing this for over thirty years. Many of our clients begin to receive settlements within a few months, but each case is different and your expected timing is therefore something that should be discussed between attorney and client. We have the resources and experience to move cases very quickly through the legal system. This is especially true for our clients who are elderly or in poor health. Although every asbestos client we have represented since 1974 has in fact received compensation, the amount varies from case to case, and we cannot guarantee the results in your case; we can only guarantee that we will work very hard for you. The third party cases that Kazan Law files are often referred to as product liability or toxic tort cases. Typically, they are against the manufacturers, distributors and/or suppliers of the substances that caused the injury and the contractors and/or owners responsible for the premises where the exposure or injury occurred. An employee who suffers a work-related injury also has a right to make a workers compensation claim against the employer. Workers’ compensation is usually a no fault system and is the exclusive remedy available to an employee to take legal action against an employer.